There's a new feature in Blogger - you can now view how much storage you’re using in Blogger Photos using their web based blog editor. Create a new post in Blogger and click the Add image button - a new window opens up where you can upload photos from your Desktop to Blogger Photos. 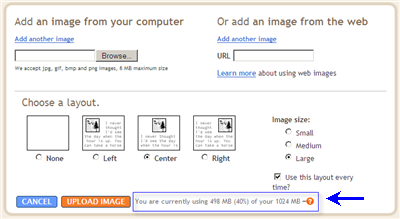 At the bottom corner, you'll see a line saying the amount of space occupied by the uploaded photos in your blog. Any photos that you post to Blogger are included in your Picasa Web Albums storage quota. Google now has a 1 GB storage limit per blog account - if you are exceeding that quota, either delete some pictures using Picasa Web Albums or buy additional storage from Google. The charges are $25 per year for 6.25GB which is way higher than rival Flickr. Compare Picasa with Flickr Photos.